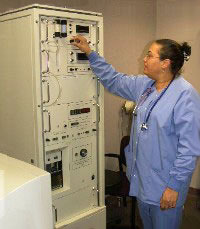 Pulmonologists focus on diseases of the lungs and airways. They diagnose and treat pneumonia, cancer, asthma, occupational diseases, sleep disorders, chronic obstructive pulmonary disease (COPD), emphysema, and other complex disorders of the lungs. They also evaluate lung function, examine the bronchial airways, and prescribe and monitor mechanical ventilation. Hawthorn Medical has developed the Pulmonary Nodule Program as part of the practice's continuing efforts to respond promptly and effectively to patient needs. When a chest x-ray or chest CT scan detects a lung abnormality, the Pulmonary Nodule Program provides patients with the opportunity to meet with a physician within 24 hours. Often, a nodule is detected as a result of a routine chest x-ray or chest CT scan. While most solitary pulmonary nodules are benign, or non-cancerous, if the nodule is malignant, an oncologist sees the patient right away. The program makes a difference in cancer treatment, if it is necessary, because the prompt diagnosis and early treatment may provide the best chance of curing the disease. By connecting patients immediately to a pulmonologist or oncologist, we are able to relieve them of the stress and anxiety of waiting.